Wednesday, 9/18 was the first official public Asulia dumpling tasting held at MIT’s Innovation Series “From Farm to Tablet”. That morning, I dropped my mom off at the airport at 5am. I’ve done this many times before, but that day felt different. I was extra concerned about her safety as she leaves for a month overseas. I got choked up because, not only does she mean the world to me, but also because I want her to be able to continue to see that her decision to become my mom was not for nothing. Then, I was nonstop all day. Kinda of surprising huh? A dumpling tasting that lasted an hour and a half took a full day of prep! I had to pick up fresh veggies, coordinate with my graphic designer, pick up the Indiegogo info cards from the printer, buy napkins and a table cloth, pack, eat something, and, oh, shower! There wasn’t an oven on site, so I found a friend that lived close by and borrowed hers. I couldn’t have pulled it off without my crew of 3 amazing ladies. It was awesome to sample to the Boston and MIT community. 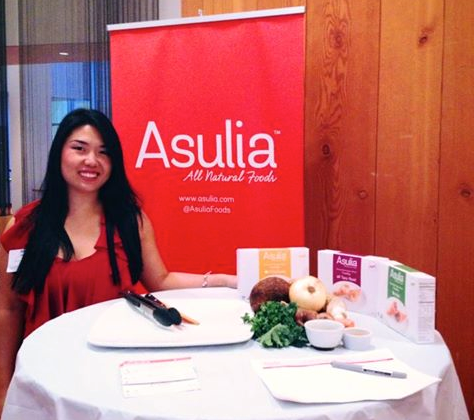 Over 100 people stopped by Asulia’s table to try our our chickpea dumplings, kale dumplings, and taro root dumplings. People loved the taste of the fusion dumplings and wanted to hear more about Asulia and my story. They couldn’t believe the average calorie count is only 44 per dumpling. Many can back a 2nd and 3rd time for more dumplings! I loved seeing people’s faces as they bit into the dumplings and hearing their comments. Instant feedback! I can’t wait to do more demos and share my dumplings with more people. Special thanks to Suzanne Brendle, Sarah Howes, and Taylor Rose for assisting! Your Mom has never had a day when she was not thrilled to be your Mom, I just know it. So glad you had a good experience at MIT! Thanks Barb! Yes, you are right. Just don’t want her to miss too much of what’s going on!